← Some “Interesting Reading” about our Sport. Check It Out!!! 2019 CAN=AM Hosted by St Petersburg Shuffleboard Club. 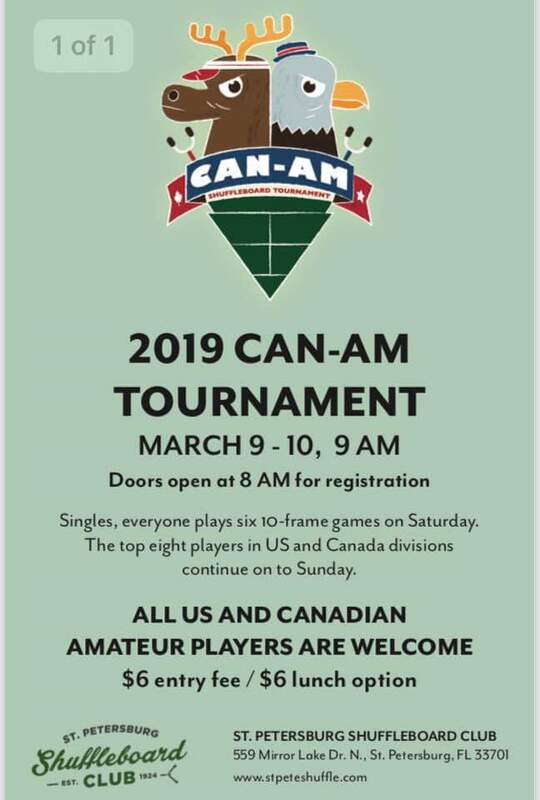 The St. Petersburg Shuffleboard Club invites all amateur players to our 2019 CanAm Tournament on March 9th and 10th. This is the club’s signature event and last year drew over 115 players. Last year’s winner, my beautiful fiance Kerry Bailey, took home over $300. The field is split into two divisions: Canadian and American. You will play six 10 frame singles games the first day. The top 8 players from each division come back Sunday to play for a chance at the title. Registration opens at 8 and play begins at 9. There is a $6 entry fee and a lunch for an additional $6 if you’d like. We hope to see you there!